By the first week of December even the smallest of town halls will have their main tree up and the Christmas lights on. 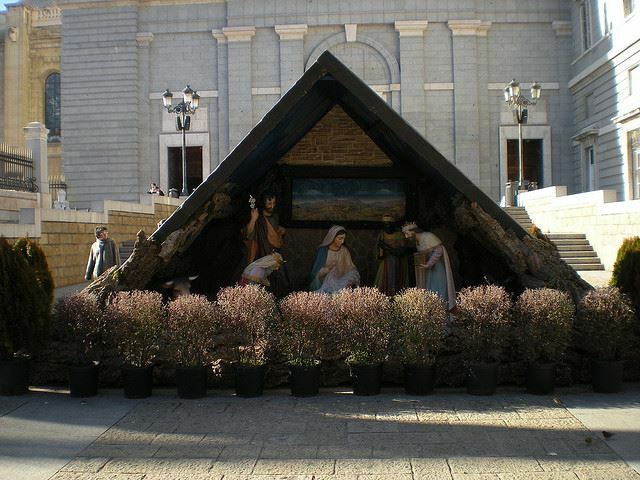 You’ll also see the ‘belen’ (meaning Bethlehem) which is a crib or nativity scene. In the larger churches and cathedrals, you’ll often find life size cribs with real people and real animals. These markets usually open the first weekend of December throughout the country. 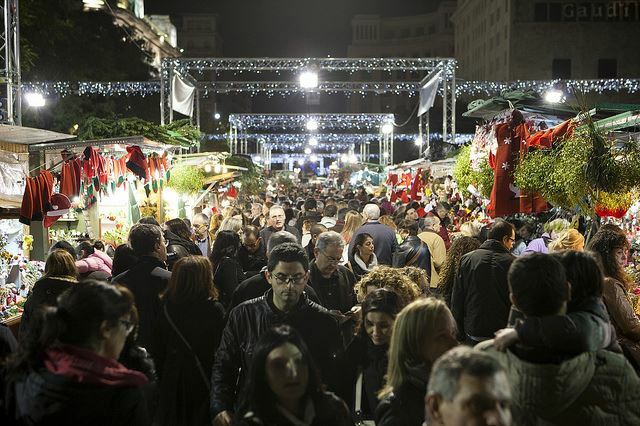 One of the more traditional ones is in the Plaza Mayor in Madrid that sells some of the finest Christmas trees and lots of smaller Christmas gift items that fit in a suitcase (see below from more market ideas). Many cities also set up ice-rink in the squares and offer skates for hire. 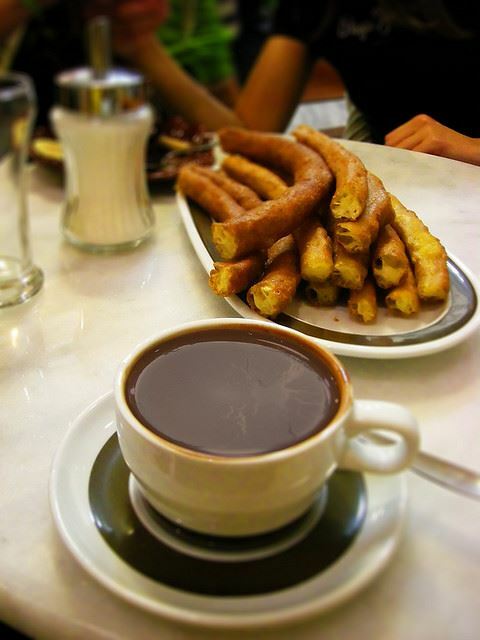 Expect to find cafes and stalls serving churros by the skating rinks and Christmas markets. And you’ll probably find a Chestnut Roaster there as well! The three activities complement each other perfectly. If you are in Spain over the Christmas season, you’ll quickly spot that seafood and almonds are the food royalty of the Spanish Christmas. In addition to the more unusual seafood items such as eels and crab, tiger prawns are consumed in huge quantities. 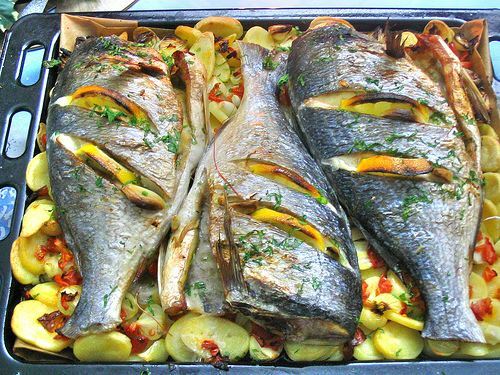 Whole fish are very popular also and fresh sea-bream is always the most traditional and therefore the most expensive Christmas fish. Cured meats are also in demand – you’ll find supermarkets, delis and traditional markets exploding with varieties of Iberian chorizos and of course Jamon Serrano. You’ll also see capon in the poultry sections alongside the turkeys. 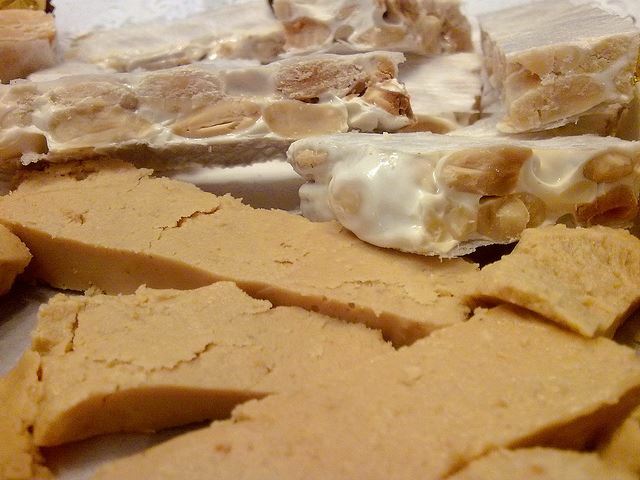 In addition to the usual chocolates and truffles, you should try the nutty/nougat-like turron, the crumbling almond polverones, the marzipaned pan de cadiz, and when you’re out and about, do try the churros with or without hot chocolate and the roasted chestnuts. If you are in Spain on December 21, make sure to find out if there are any interesting events locally. 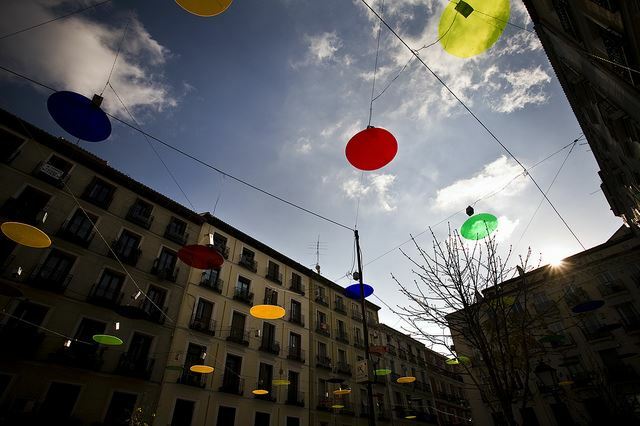 In Granada and Jaen, for example, you’ll be able to see the leaping of the bonfires – called hogueras. Jumping the fire is supposed to bring good luck for the next year. On December 22, the El Gordo lottery draw (The Big One) is treated by many Spaniards as the official beginning of Christmas. The draw is televised and you should watch some of it on TV to get a sense of the tradition. The drawn numbers are sung, rather than spoken, by the children at the San Ildefonso residential care centre in Madrid. 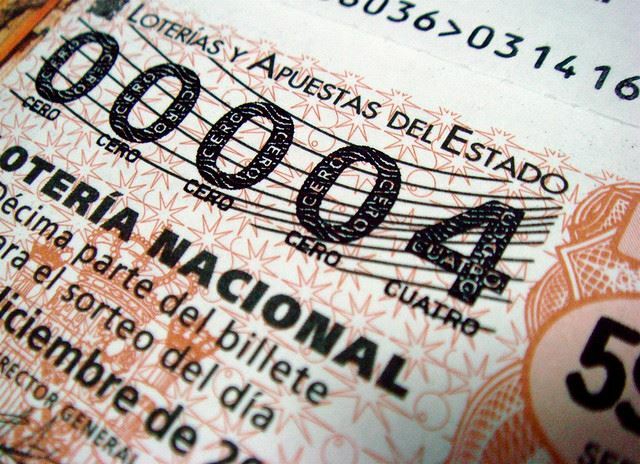 The tickets for the winning numbers are expensive (about 200 euros) so rather than buying an entire ticket, Spaniards buy shares of a ticket called ‘decimos’. You’ll be able to pick one before the draw at cafes, restaurants and shops throughout Spain. On the day of the draw, you’ll see lots of TV footage of the winners, which is often a workplace or an entire village. 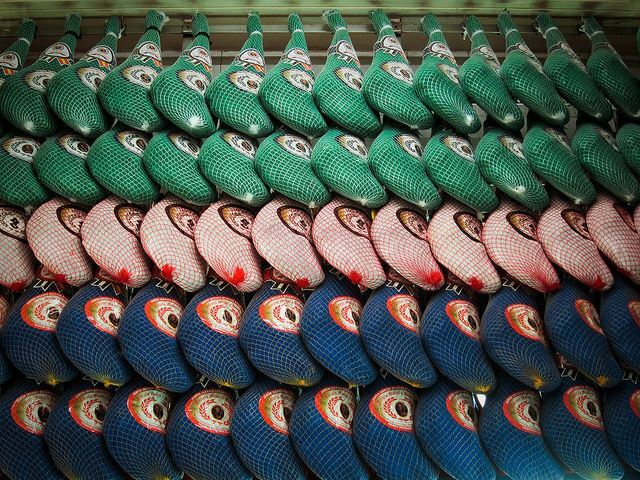 Around the day of the El Gordo draw, you’ll see office-workers going out for a special Christmas lunch or dinner. If you see people walking around with legs of ham on these days, you will probably work out that it’s a common Christmas gift from suppliers to companies and from companies to employees. Known as Nochebuena, Dec 24 is the first big celebration. Businesses and shops close around 3pm that day to allow workers get home and prepare meals or go out and have a pre-dinner drink or two before the family evening meal starts at 9pm or even 10pm. Fish and seafood are popular for this meal. December 25th is celebrated with a lunch in the middle of the day. The typical Spanish family meal is again a formal one – expect cold starters or cured meats, possibly some seafood delicacy and for mains, turkey may make an appearance. Santa may deliver a small gift to some Spanish children – however the more traditional date for present-receiving is January 6th. Curiously, cinemas are very busy on the afternoon of the 25th! The next day of note is the ‘Dia de los Inocentes’ on Dec 28 – which is the Spanish April Fools Day. It’s actually a remembrance of the slaughter of the innocents by King Herod. Nothing funny there at all, but the connection between the two events is in being able to say “I’m innocent”. In Spain, all the newspapers and TV stations run fake stories. Children play pranks and tell jokes – and say ‘inocente, inocente’ when they’ve been rumbled. Some towns and cities mark the day in a special way – for example in Tremp in Lerida, a giant papier-mâché doll is hung from the belltower – songs are sung to bring the body down and it is set alight. In Ibi in Valencia, a huge flour fight is held on this day. And in these time of Twitter, many Spanish sportspeople and celebrities use the day to play a joke – announcing an early retirement etc. 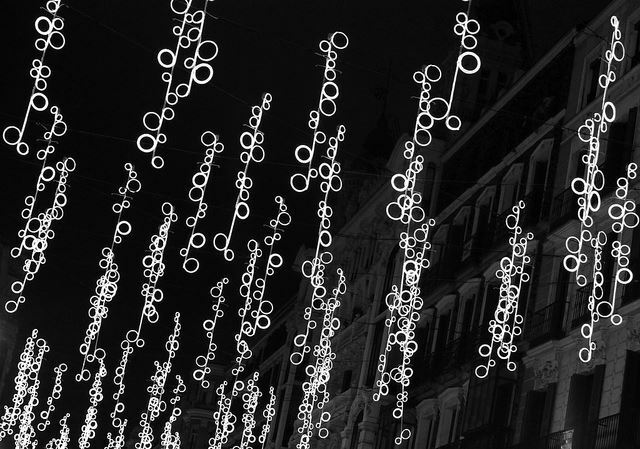 In Spanish, New Year’s Eve is called Nochevieja meaning Old Night. Families again come together for an evening meal at home or in a restaurant or hotel. Dinner is served at 10pm and all the food must be consumed in time for the countdown at midnight. This is when Spaniards listen or watch the bells chime at the Puerta de Sol in Madrid and for good luck, eat twelve grapes (find seedless ones if possible!) at each bell strike or chime. Then the fireworks kick off (brace yourself!) 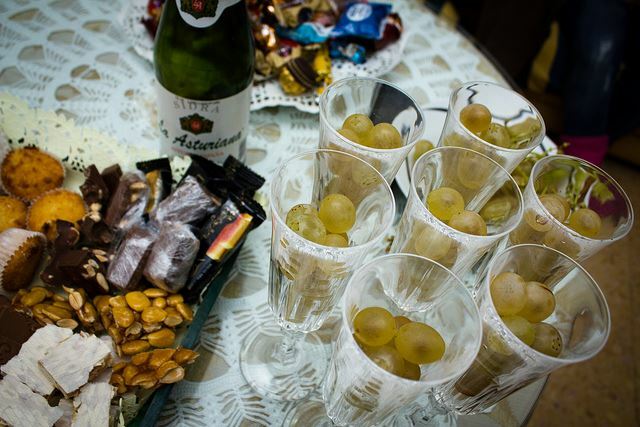 and the bubbly flows – usually cava. If you are out, you’ll find that the bars are busy until 10pm or 11pm and go quiet for a while until people spill out onto the streets again around 1am. Many hotels and restaurants offer a special New Year’s Eve evening meal and entertainment which is called a ‘cotillon’. And just when you think you can’t possibly eat any more – it’s Jan 1 – New Year’s Day – and in Spanish households that means time for another large meal in the middle of the day. This is the penultimate of the family get-togethers. You might find lamb or beef on the menu as well as the cured meats or seafood starter. You may need a long walk or a nap after the previous night’s excesses. Remember that you have a few days to recover before the final event – and the most important for the younger members of the Spanish family. 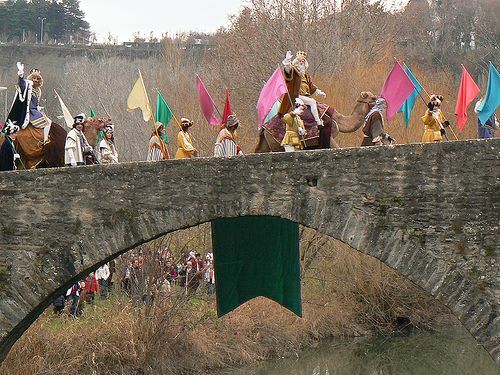 Letters have been written weeks in advance and children go to the centre of their town or city late on Jan 5 to see the Three Kings Parade – called a cabalgata – through the streets often with camels and usually with a number of floats. Before heading to bed, each child leaves out a slipper in the same way a stocking may be hung elsewhere – for the present. A drink might be left out for the kings and something for the camels as well. 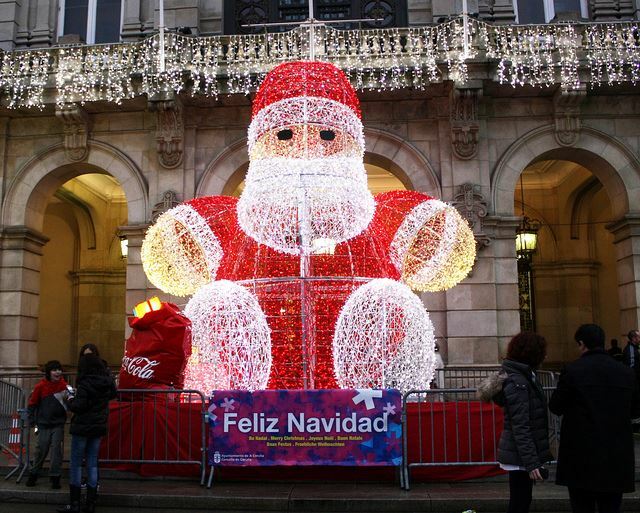 January 6 is the day the Three Kings deliver Christmas presents in Spain. 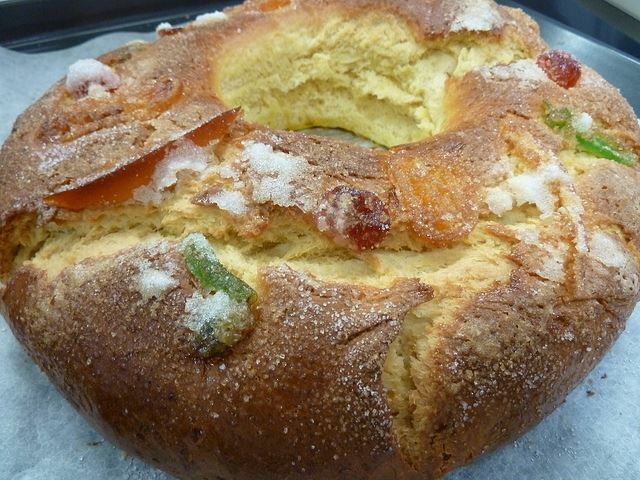 On the morning of Jan 6, a roscon, which is something in-between a panettonne and a large Danish pastry – is eaten with breakfast. It contains a little gift or toy inside so be careful not to bite too hard. Whilst munching their roscon and playing with their new toys, children usually comment on how they heard the camel’s hoofs on the roof or terrace. Anybody who hasn’t behaved well during the year is given coal – or a bag of sweets or candy that imitates the look and shape of a small bag of coal. Families will have the last Christmas lunch together and afterwards everybody vows to go on a diet for the rest of the month. 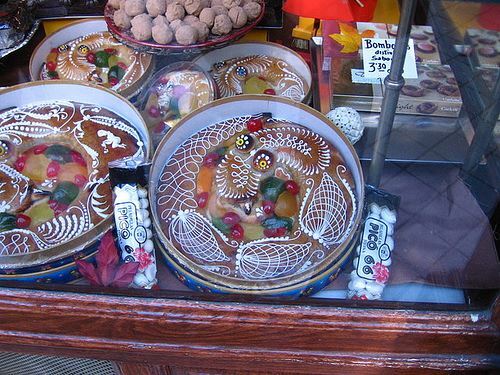 Because present-giving is much later than other countries – sales shopping is also delayed in Spain. You may find some stores discounting throughout the Christmas period but legally sales cannot commence until after the Kings Day. Pro-tip: If you are you considering a trip to Spain over the Christmas holidays, you’ll find eating out very tricky on the key dates such as Dec 25 and Dec 31. 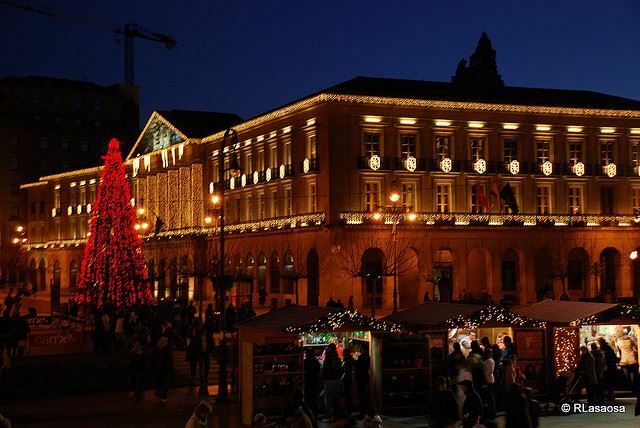 Why not let us plan your itinerary including hotels, restaurants and all the details and directions for the regional fiestas, Christmas markets and other celebrations that you should experience at this time of year? Tempted to arrange a Private Custom Tour of Spain and Portugal? Then contact the Travel Experts at Totally Spain – EMAIL US HERE or immediately REQUEST A FREE CUSTOM TRIP QUOTE HERE You’ll be glad you did. Posted in Barcelona, Bilbao, Entertainment, Festivals, Food & Drink, Getting Around, Granada, Insider Spain Guides, Jaen, Madrid, Popular Posts, Seville, Shopping, Spain, Useful Information, Valencia and tagged belen, Christmas, Christmas markets, churros, Dia de los Inocentes, El Gordo, food, grapes, key dates, lottery, marzipan, Nochebuena, Nochevieja, parade, Puerta de Sol, roscon, San Ildefonso, shopping, Spain, Three Kings, turron.